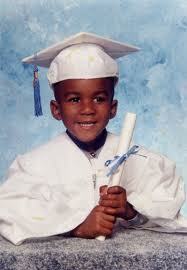 I love this picture of Trayvon Martin in his cap and gown. Sadly, too many children of color rarely wear it past the 6th grade. I’ve witnessed parents celebrate 6th grade graduation like their child just received his or her law degree. I barely remember my 6th grade graduation; I absolutely remember my doctoral hooding. My doctoral hooding was filled with tears from family and friends; I, as my Mother said a year before her passing, would be the first. As my parents could only watch from Heaven, their experience with the Jim Crow south is what informed the pact they made as a young married couple: our kids are going to college. My parents told my sister and I that we could go as far as we wanted; Masters and Doctorate respectfully. The ancestors spirits guided me through many a night of study, anguish, racism and doubt. Am I suggesting that the infamous “hoodie” becoming a symbol for justice for Trayvon Martin is a panacea? Is the fact that so many people of color, especially boys and men are associated with negativity based on wearing a “hoodie” (which in my day was just a sweat jacket with a hood…but I digress) the reason why they are suspect, and we need a new image? Answer to question #1: NO! Answer to question #2: YES! We need a new image!! The image of that little mortar board on little Trayvon Martin beyond 6th grade instead of matriculating to an orange jumpsuit, sagging pants, and so-called gangster attitude. The image of African American/Black marriage and family being as top a priority as pursuing the highest heights of education. The image of home ownership instead of driving a luxury car and living in a rented shack. The image of financial stability versus barely making it. The image of entrepreneurship as the “first choice”. The image of reading, speaking, and articulating for debate, discussion, and delineation. The image of playing outside…again – without fear of getting shot, stabbed, or kidnapped. The image of African American/Black Men protecting their neighborhood and their family; and checking each other when they make mistakes or fall. The image of every Black Father, Grandfather, Uncle or Big Brother who knew who your parents were, and would not be shy about reporting any disrespectful behavior; and would be supported (instead of getting “don’t holla at my baby” OR “not my child“…but once again, I digress). Look, I like my sweat jacket with a hood more than the next person; keeps my ears warm when I need to go outside for a minute. Yet now it has become an apparel lexicon for criminal intent; proven, or not. A profile has prevailed. We know that racism has not exempted a suit and tie wearing African American Man from suspicion (a la President Obama, Malcolm X, Dr. King, Roland Martin, Your Father, My Father, etc.). However, there’s something about a Black Man in a suit that makes one sit upright…stare lovingly…be respectful. The only thing Roland Martin did wrong…was forget focused on his alleged homophobic twitter rant during the 2012 Superbowl; leading to CNN’s subsequent suspension of Roland Martin. Currently it has been reported that CNN has lifted Martin’s suspension. After meeting with GLAAD (Gay & Lesbian Alliance Against Defamation), and offering apology the journalist is allowed to…well, I’m not sure. Ok…basically the suspension was lifted. The larger message: African Americans, particularly men are prohibited from saying anything about anyone if they represent television. Remember Isaiah Washington’s alleged homophobic comments on the set of Grey’s Anatomy toward co-star T.R. Knight, and then later at an awards show stating “I did not call him the f-word”? Washington acquiesced and met a litany of demands to rectify the situation: his contract was not renewed. In the words of the Spinners song “Could It Be I’m Falling in Love”…that’s funny! Moral of this story, or the message thereof sent to Roland Martin, Isaiah Washington, or any other Black Male of celebrity – continue to speak your mind on things that matter; for surely downgrading and defaming African Americans will rarely get you suspended, fired…or taken seriously.